In storage, this FAS2040 is well known by this IP address, but if it can help, its IP on 10.25 network must be used to be mounted on VMware, this is where the NFS network belong. As you are doing this operation from the backup node, Host Service might not aware of the credentials of the backup node. You need to push the credentials into Host Service using the below steps. That's an interesting answer, but this system do not appear in host services, because it is not used as a primary storage, only for snapvault, and because of that (VMware has no knowledge of a system at this IP) it does not show up. I can add it manually in the service edit window, but when I confirm, it does not stick in the bottom list, only the primary systems currently mounted does. I don't think this is the problem because it used to work with the same situation. hypothèse,à copier, distribuer ou conserver ce message. Can you check the is the job for pushing the credentials is successful? Whats the IP Address the secondary filer is added in DFM? I assume you didn't change the credentials of the primary controller. 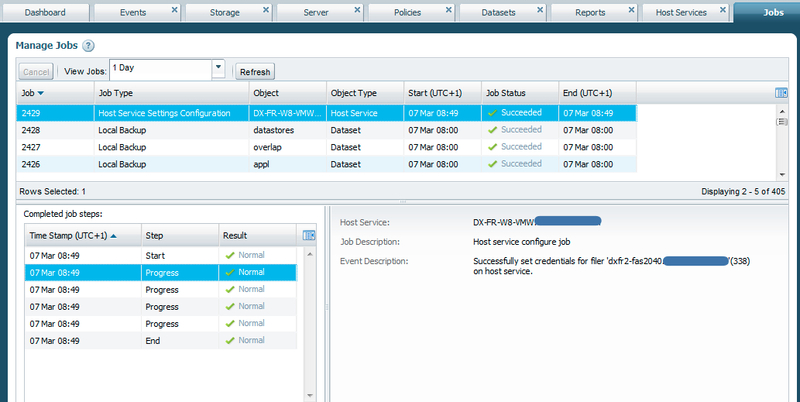 Also check in the bottom panel of the Host Service the primary controller is listed with everything good. The fix was to do "options license_feature.multistore.enable on" on the controller which is mentioned in the error message (running 8.1). The eventlog of the server where the Host Package is running (in the application branch of the event viewer) was pretty helpful there. Every other log I checked was a complete dead end. I just wanted to mention this, because a google search for "No storage system configured with interface" yields exactly two hits, one of which is this thread. After that I did "dfm hs controller setlogin -p https <HSID> 192.168.x.x" on the OnCommand Server and restarted the Host Service. Not sure, if the last one was needed, but after that the controller instantly appeared under the managed systems and everything worked. The controller cannot be added if its IP address cannot be matched with VMware mount I think. 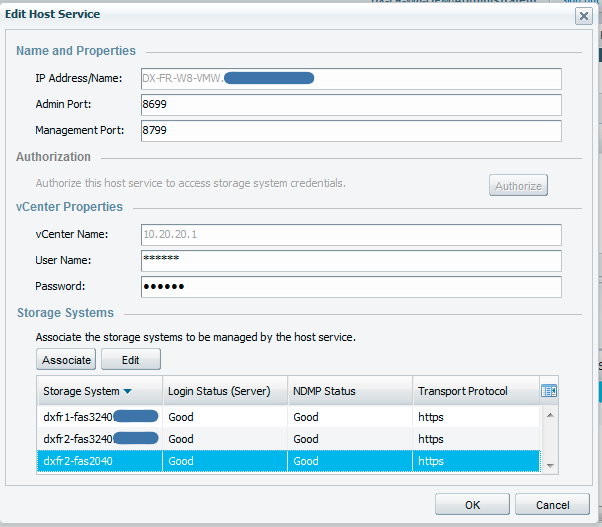 I set the IP of the filer on the storage network as the hostPreferredAddr2 and after a refresh, the controller was there.